Chemicals are everywhere. The global industry is set to grow four-fold by 2060. But toxic workplace exposures are already claiming at least a million lives each year. 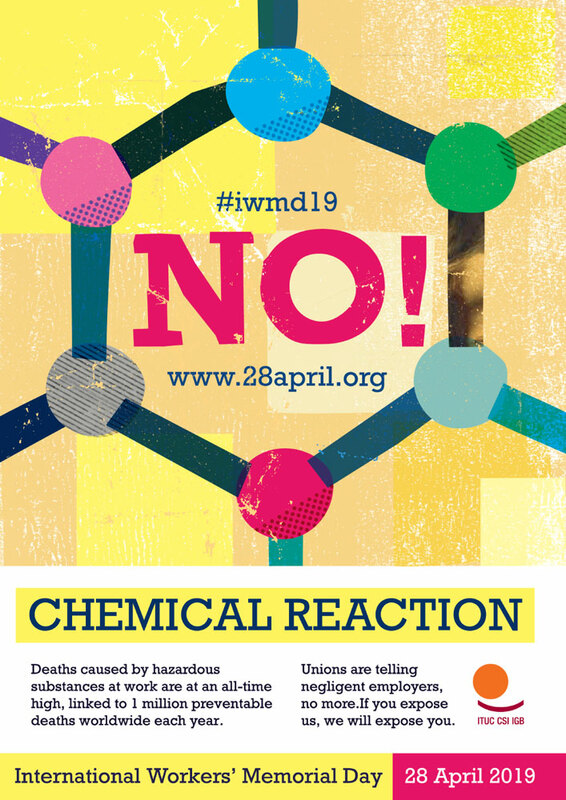 Sharan Burrow, head of the global union confederation ITUC, spells out why a new trade union campaign is an essential step to stopping the chemical carnage. 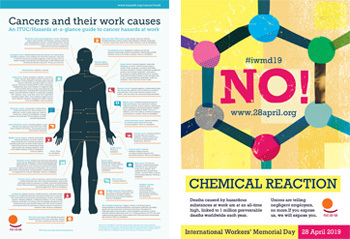 CHEMICAL REACTION Global union confederation ITUC has confirmed the theme for International Workers’ Memorial Day on 28 April 2019 - ‘Taking control - removing dangerous substances from the workplace.’ The campaign, on what has become the world’s largest annual health and safety event, will emphasise a ‘Zero Cancer’ approach, urging reps to seek to eliminate or minimise exposure to carcinogens in the workplace. 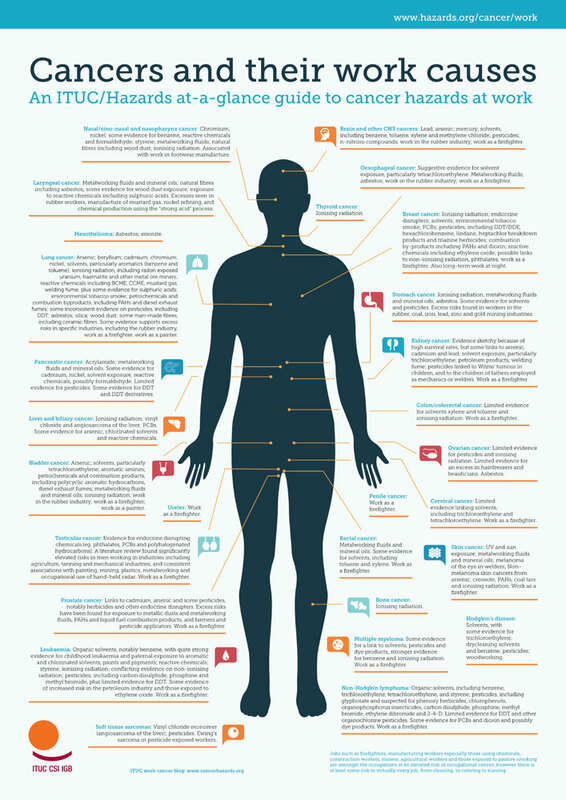 A first of its kind ITUC at-a-glance guide to work cancers and their causes, produced with Hazards, will ensure unions can identify and challenge preventable and potentially deadly exposures. The high profile 28 April annual event, which in 2018 saw tens of thousands of activities in over 70 countries, has ‘trended’ on twitter in recent years. www.28april.org; #iwmd19. Hired guns. Inept, cowardly or corrupt law enforcers. An unscrupulous rogue chasing profits whatever the cost. It’s not a B movie western. It’s the global chemical industry, a runaway giant that sometimes behaves above the law, with deadly consequences. It can get away with this because it resorts to illegal or unethical practices to bury the evidence of health risks linked to its products. Chemical products are so central to industry that the industry can use its influence to disrupt, delay and frustrate efforts to replace toxic products with alternatives that don’t kill or cause disease. Whether its accomplices are lawmakers or laboratories, corporate chemistry can and does pay to get an undeserved clean bill of health for some of its best earners. And it doesn’t just load the dice. It uses gutter tactics to discredit or harass its opponents. If you think this is a bit fanciful, or even paranoid, consider these events from recent months. In November 2018, K2 Intelligence found itself paying ‘substantial’ damages to five prominent anti-asbestos campaigners on three continents. The confidential settlement came after evidence emerged the top US corporate surveillance consultancy had orchestrated a covert, four-year operation intended to undermine efforts to ban the world’s most prolific workplace killer. The sophisticated spying operation was financed by international asbestos interests. These still powerful promoters of a dying industry, also maintain their own roster of tame scientists churning out asbestos absolving health studies and expert witness statements to order. Also in November 2018, a report for the European Parliament concluded European regulators based a 2017 decision to relicense the cancer-linked weedkiller glyphosate on an assessment large sections of which were lifted directly from industry documents. It followed a September 2018 admission by the journal Critical Reviews in Toxicology that agrochemicals giant Monsanto covered up its heavy involvement in published research that claimed glyphosate-containing Roundup, the world’s best-selling herbicide, is safe. A January 2019 paper in the journal Environmental Sciences Europe noted 70 per cent of independent, peer-reviewed papers on glyphosate examined by the World Health Organisation’s International Agency for Research on Cancer (IARC) found evidence of genotoxicity, or DNA damage, a key indicator of human cancer risk. By contrast, only 1 per cent of the usually unpublished industry studies found this association. In November 2018 Korean electronics giant Samsungelectronics giant Samsung, after ten years hiding the truth about scores of its workers dying from exposure to toxic products used on its production lines, finally apologised and agreed compensation for those affected. It’s an industry strategy that succeeded in putting a brake on the development of tighter chemical exposure standards. Even where they are introduced, improvements are delayed and diluted during the standard-setting process. This doubt-deny-and-delay exercise has been repeated for benzene, silica, chromium, beryllium and a litany of other causes of serious occupational diseases, including cancer. But even low level exposures in well-regulated economies can come with significant risks, guaranteeing an unabating output of surreptitiously-financed denial science, disputing evidence of risk below the current and generally lax occupational exposure standards and on the range of cancers and other chronic diseases these cause. The re-emergence of ‘old’ occupational diseases like silicosis and black lung – a lung-shredding condition now striking faster and more viciously in US and Australian coal miners – suggests the direction of travel even in the wealthiest nations may have been sickeningly reversed. 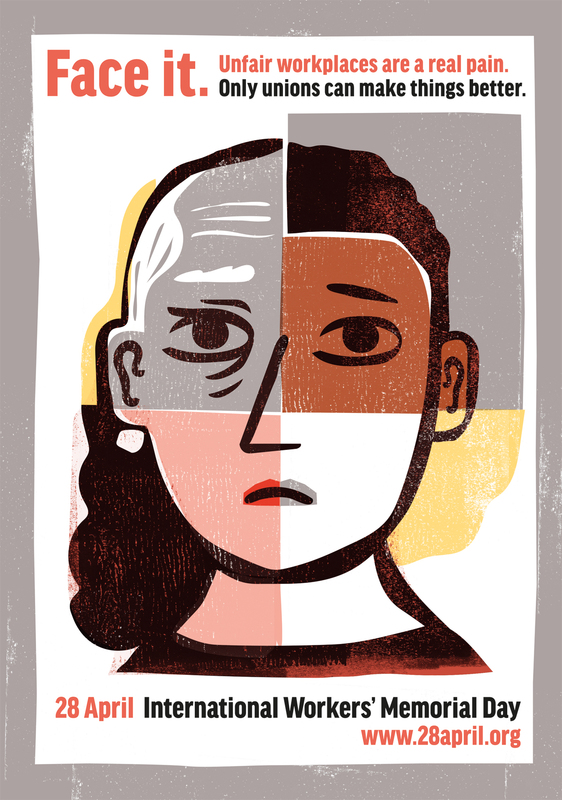 It is a health and oversight crisis that requires action now. The chemical industry is set to double in size by 2030set to double in size by 2030, with a January 2019 Global Chemicals Outlook policy briefing from the EExecutive Director of UN Environment noting this will “increase exposures, concentrations and adverse health and environmental impacts,” if we continue to allow the mismanagement of chemicals and waste worldwide. It will need to be, if it is to address the industry’s helter-skelter growth. A January 2019 report from the Organisation for Economic Cooperation and Development (OECD) noted “the chemical industry is one of the largest industrial sectors in the world and is expected to grow four-fold by 2060.” OECD estimated annual global chemical industry sales will rise from US$5.7 trillion in 2017 to US$21.7 trillion by 2060. The industry’s global financial heft already exceeds that of all nations except the USA and China, based on GDP.But it is a rich industry with a poor health record. 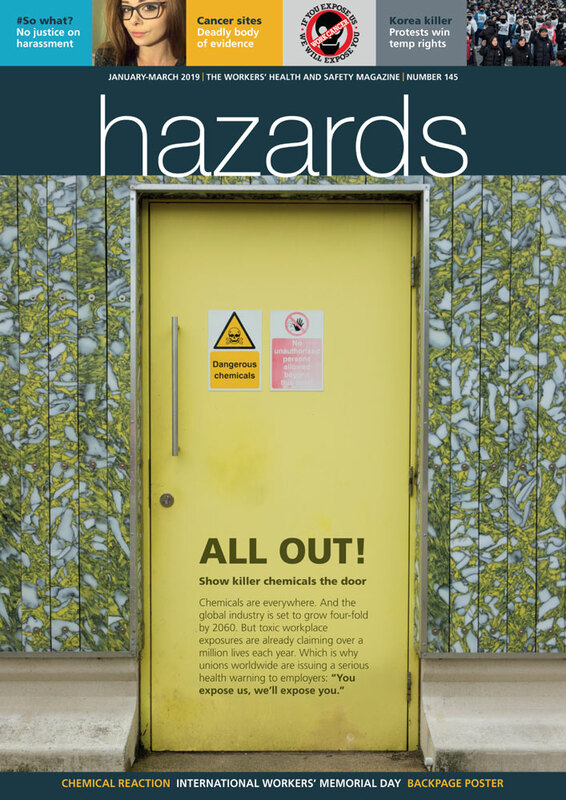 Even at today’s production levels, every year over one million people die as a result of exposure to hazardous workplace substances, with the International Labour Organisation estimating 666,000 of these lives are claimed by occupational cancers. Long latency periods between exposures and onset of these work-related diseases mean many of today’s deaths are the product of the much lower levels of chemical consumption decades ago. Yet we continue to introduce more chemicals, in greater volumes, in more forms and combinations, with the industry’s attention focussed on applications rather than risks. 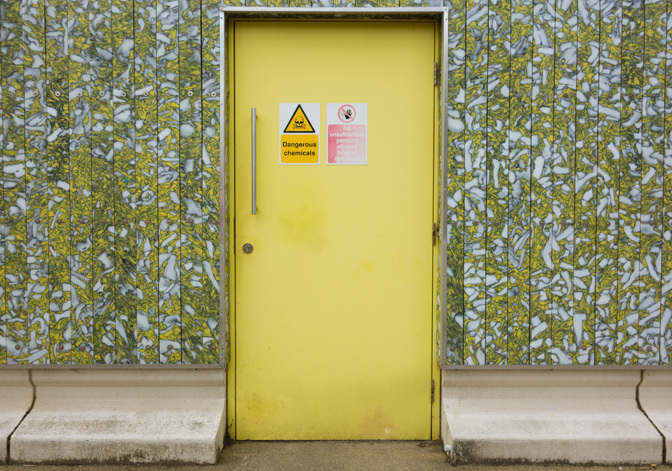 A European Chemicals Agency (ECHA) progress report released on 28 February 2019 revealed it that of the 21 substance evaluations completed in 2018, only 6 (28.5 per cent) of the substances were “sufficiently controlled,” with “further risk management measures” required for the rest. Chemical companies failed to provide important safety information on potentially serious health effects in nearly three-quarters (211 of 286) of cases checked by authorities in 2018. It is a disregard for health that comes at an economic as well as a human cost, although much of this is defrayed to the worker harmed and the public purse. A December 2018 report from the European Trade Union Institute (ETUI) calculated that work-related cancers along cost between €270 and €610 billion (US$307/£240bn to US$693/£543bn) a year across the EU. 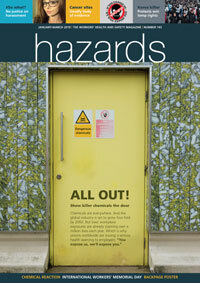 In human terms, the cost of hazardous workplace exposures is one worker death every 30 seconds. It is not happening, because corporate chemistry has captured regulators, bribed obliging scientists and attacked its detractors. It is a fatal endeavour that must be stopped. The campaign to stop glyphosate reauthorisation in the European Union failed, “but it succeeded brilliantly in exposing the agrochemical industry's grip on the regulatory agencies tasked with protecting public health and the environment,” global food and farming union IUF has said. A February 2019 IUF briefing notes: “In the wake of the Monsanto Papers revelations and effective campaigns channelling public outrage over the EU's farcical reauthorisation of the world's most widely used herbicide, the European Parliament last year established a Special PEST Committee to examine the procedures under which pesticides are authorised for use in the European Union. It adds the PEST Committee's report, “released in December 2018 and approved by an overwhelming cross-party majority of the parliament on 16 January, catalogued the multiple failures of the authorisation process”. The report of a cross-party group of MEPs found Germany’s Federal Institute for Risk Assessment (BfR) copy-and-pasted tracts from studies by the pesticide manufacturer Monsanto. The investigation found the report, on which the reapproval was based, showed “clear evidence of BfR’s deliberate pretence of an independent assessment, whereas in reality the authority was only echoing the industry applicants’ assessment.” The MEPs’ investigation found Monsanto’s text in 50.1 per cent of the chapters assessing published studies on health risks – including whole paragraphs and entire pages.